Bowling Green native and Greenwood High School alum Corey Hart capped his first half with an All-Star selection which turned into a starting role after injuries. Hart batted .288 with 21 home runs and 65 RBI in the first half. His 21 home runs rank third in the National League and his 65 RBI are tied for the league lead. 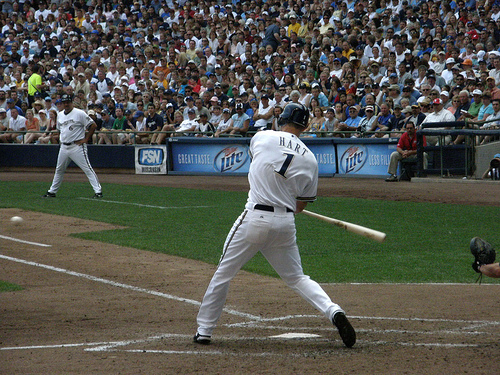 Hart also ranks fourth in the National League in slugging percentage (.569). Louisville native and former Morehead State University right-handed pitcher Jon Rauch was thrust into the Twins’ closer position after perennial All-Star Joe Nathan went down with a likely season-ending injury in Spring Training. Rauch has done better than anyone could have expected with a 2-1 record, 2.38 ERA and 20 saves in 24 save opportunities. Rauch has struck out 25 and walked just five in 34 innings pitched, and his 20 saves are tied for fourth most in the American League.